Internet memes – what would social networks look like without them? We all “like” some, share, and laugh at the most clever ones (others…not so much). Memes are a simple way to communicate to your social network your opinion on various issues from issues as serious as war and peace to more innocuous issues like which way is the proper way to install a roll of toilet paper (I’m an anarchist on that question). Not everyone has the time to write lengthy blog posts about these issues but almost everyone has enough time to click “share.” Like blog posts do, sometimes, these memes open up great discussions or debates (but often devolve into childish nonsense…sadly). There are a few memes that are so incredibly inane that you will wish there was a “dislike” or “this is so stupid” button option when it crosses your news feed. The following are 5 memes which deserve to die by way of a logical response. These are numbered but not intended to be in any particular order as they all just need to die. For some reason, people on the Left have a huge hate on for the Koch brothers. 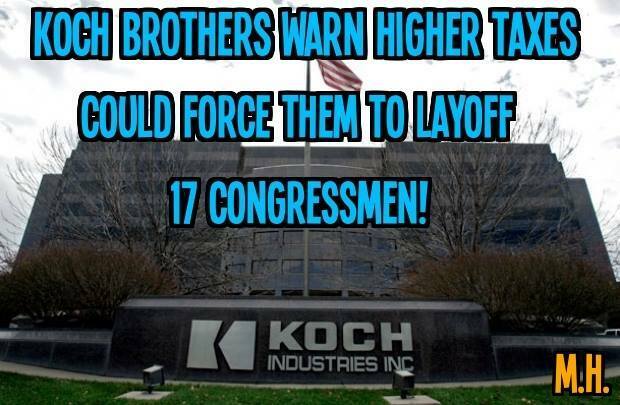 If we are to believe the above meme, the Koch brothers are so rich and powerful that they could single-handedly fire 17 or more congressmen. Apparently, its only a few wealthy individuals and/or multinational corporations which advocate Right-wing ideas who lobby in Washington or contribute to campaigns and form super PACs. According to Opensecrets.org, Koch Industries ranked #14 in the 2014 election cycle and #50 all time. To put the remaining contributors into perspective in the 2014 election cycle, 29 of the top 50 corporations donated most or all their money to Democrat/liberal campaigns while 9 donated most or all their money to Republican/conservative campaigns (the remaining 12 donated more or less evenly to both though some certainly leaned more one way or the other). Of course, dividing these campaigns into “liberal” and “conservative” is itself, problematic. David Koch is more of a libertarian (small “L” to be sure) than a conservative. He supports many of the same causes that progressives do such as cutting military spending, being anti-war, supporting gay rights, and ending the war on (some) drugs. Apparently being socially liberal isn’t good enough; being fiscally conservatives make the Koch brothers the spawn of Satan. The underlying complaint here is that there is too much money in politics. I have a very simple and practical solution: if you don’t like money in politics, get politics out of money. If those in congress only did what they were constitutionally permitted to do there would be little or no reason to lobby at all. 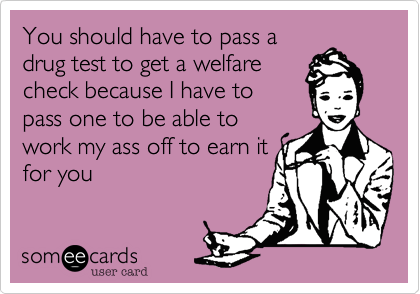 I have to admit that I was a little more sympathetic to the notion of drug testing people receiving welfare when I first heard it being proposed. After all, when you take money from taxpayers who are earning and paying for your basic necessities of life, do you not at least have the obligation to prove you aren’t blowing the money getting high instead of looking for work? While this is a great idea as a principle, it turns out its a terrible idea in the real world. If the idea of drug testing is to save money, then the problem is – it doesn’t. Florida had this law (before it was struck down by a federal judge) and the results were quite interesting. Of 4,086 people who were tested for drugs, a whopping 108 tested positive. The costs of requiring the welfare recipients to take the drug tests cost more that what it saved from rejecting the 2.6% who failed. Other states which have tried this experiment had similar results. Either way, let’s be honest, passing hair tests is easy if you try hard enough, so what’s the point? I think its very important for those of us who dislike the welfare state remember that its not just the poor who receive it. There are parasites whose entire existence is made possible only through wealth redistribution but there is more than one class of parasite. If the true reason behind drug testing is to humiliate those receiving a government check (because we now understand that it isn’t to save money) then we should ask the board members and CEOs of all the major corporations receiving corporate welfare and bailouts to stand in line to fill the cup up to the line as well.